Which Is Better, the Pentair IntelliBrite 5g or Hayward ColorLogic 4.0 Light? Pentair IntelliBrite 5G or Hayward ColorLogic 4.0? For years, pool owners have debated which LED light is best for the swimming pool. More specifically, pool owners want to know if the Pentair IntelliBrite 5G or Hayward ColorLogic 4.0 LED light is better? The debate is so intense, you can literally do a Google search and find pool owners asking the same question. 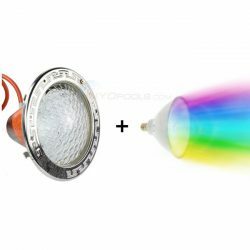 Determining which pool light is better between the IntelliBrite and ColorLogic is not as straight-forward as you might think. 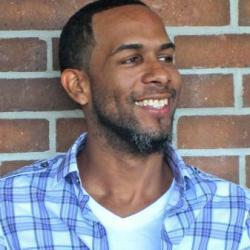 In fact, a lot of different variables come into play before making a decision. Before we give you our opinion, let’s look at what makes each light special, and not so special. Believe it or not, there are some pool owners who prefer white lights over colored lights. Hey, we’re not here to judge you. If you’re one of those pool owners, Pentair has you covered. The IntelliBrite 5G LED lights are available in both white and in color. The white IntelliBrite light boasts the most energy-efficient white light on the market. It is brighter than incandescent lights and almost 10x more efficient. In fact, the 5G white light uses only 55 watts to produce the same light output as a 500-watt incandescent light. You save 89% in energy consumption by using a white IntelliBrite 5G light. However, if you’re like me and prefer the best of both worlds, you might as well stick to the colored LED lights. White is one of the 5 fixed colors the colored LED light offers. So, you can actually enjoy the colored and white light. Check out the Pentair calculator for more details on how much money you can save by switching to a white Pentair IntelliBrite LED light. The Pentair IntelliBrite 5G color-changing light emits vivid illumination using less than half the energy of other LED lights. In fact, the IntelliBrite 5g color pool lights consume only 26 watts, which is equivalent to a 125-watt incandescent light. Overall, it uses significantly less energy than traditional incandescent and halogen lights. 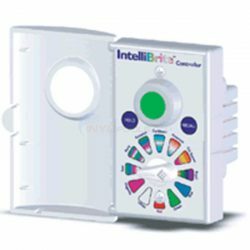 The IntelliBrite includes 5 fixed color settings plus 7 additional pre-programmed light shows. According to Pentair, the IntelliBrite 5G light is superior to their competitors. They claim, “No other LED light offers the efficiency or freedom of IntelliBrite 5G lights.” One of the most differentiated features of the IntelliBrite is the flexibility of the light’s lens. The reflector design allows pool owners to adjust the lens from a wide angle to a narrow one. The manufacturer installs and ships the IntelliBrite 5G in wide-angle focus. 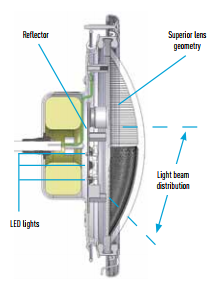 The light’s lens geometry in wide lens positions for greater underwater coverage. By twisting the lens 180 degrees, pool owners can switch to a narrow or reflection angle. In this position, the light’s intensity and distance increase. The narrow -angle is better if you’re looking to light a dead spot in the middle of your pool. The design of the lens plus the design of the reflector combine to provide direct light beam distribution and ensure light is directed towards the bottom of the pool. pool and spa owners who don’t own automation systems. The remote gives pool owners the ability to switch colors or light shows. Pentair designed the controller exclusively for IntelliBrite color-changing lights. The IntelliBrite 5G lights are also compatible with the Pentair IntelliTouch or EasyTouch automation systems. Pentair offers the IntelliBrite 5G light for pools and spas. Each light is available in 12 V and 120 V and varies in cord lengths from 30 to 150 ft. If you have an older IntelliBrite light, don’t worry, the functionality is the same. The only difference between the older version IntelliBrite and the new 5G version is the 5G version has a lower wattage consumption. In short, it’s simply a more efficient and better light. Now I usually don’t talk about pricing but let’s not pretend that pricing doesn’t influence purchases. Generally, LED lights are rather pricey. However, in most cases, pool owners spend less money overall due to fewer replacement parts and longer longevity. Still, the price for each light varies with the cord length and type of light. For example, spa lights are usually cheaper than pool lights. Also, lights with longer cord lengths are more expensive than ones with shorter cords. The Hayward ColorLogic 4.0 is one of the most popular lighting systems on today’s market. In fact, it has the fastest responsive system ever, giving your pool vibrant colors and high efficiency. The LEDs in the ColorLogic can save pool owners up to 79% on energy costs when compared to traditional pool lighting. Unfortunately, the ColorLogic 4.0 is only available in color. If you prefer white lights over colored light, Hayward offers the CrystaLogic White LED light. 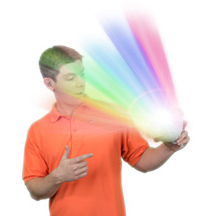 The ColorLogic 4.0 light emits 5 fixed colors and 7 different light shows. Hayward utilized patented Chromacore technology to build the ColorLogic. As a result, they provide 10x longer lifespan than incandescent lights. Additionally, the ColorLogic is perfect for new or existing pools. It has no bulbs, filaments, color wheels, or any other moving parts. Although the ColorLogic 4.0 version is 50% brighter than the ColorLogic 2.5, unfortunately, due to the timing of shows and sequencing of lights, they are not compatible with ColorLogic Gen 2.5 lights. The flexibility in programming is the best feature of the Hayward ColorLogic 4.0. Unlike other LED lights, the ColorLogic 4.0 LED light allows you to select the color, light show, speed, motion, and brightness. Every pool owner can choose from 10 solid colors and 7 dynamic color-changing light shows. However, if you own a Hayward automation system, you get even more features. 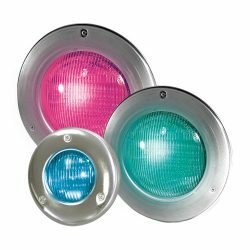 When integrated with a Hayward automation system, the ColorLogic network LED lights expands to offer 101 solid colors and 11 light shows. This is an extra bonus for pool owners who purchase Hayward products. So, if you own a Hayward automation system and are on the market for new pool lights, the ColorLogic light sounds good. One of the downsides to the ColorLogic 4.0 is that it does not sync with older models. In order for the light colors or light shows to sync, they must all be the 4.0 version. Still, pool owners also have the option of purchasing the ColorLogic Light Controller. The controller can be wired to control your pool and spa fully and is sold as a stand-alone part. 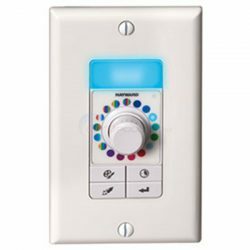 It actually retrofits into an existing light switch, making it easier to install than any other controller on the market. The ColorLogic is available in pool and spa lights but only in 120V. The cord lengths range from 30 ft. to 150 ft. Additionally, pool owners also have the option of choosing between a stainless steel or a white plastic face ring. You can easily find all of the information presented thus far online. However, what you can’t find are opinions and reviews from pool professionals. To help this article, I emailed the INYO Pools customer service representatives to get their opinions about their experience with both the Pentair IntelliBrite and Hayward ColorLogic lights. Based on your experience with customers and in the field, what is the biggest issue or concern with the IntelliBrite? There’s one screw in front of the light that consistently rusts. Overall, it’s a great light- until the light goes out. Then you have to buy a new fixture. If the bulb or board goes bad, you have to replace the entire light fixture. Like all LEDs, once they go out you need to replace the complete unit. These tend only to last 3-4 years. Half of the board will go out before the complete unit. 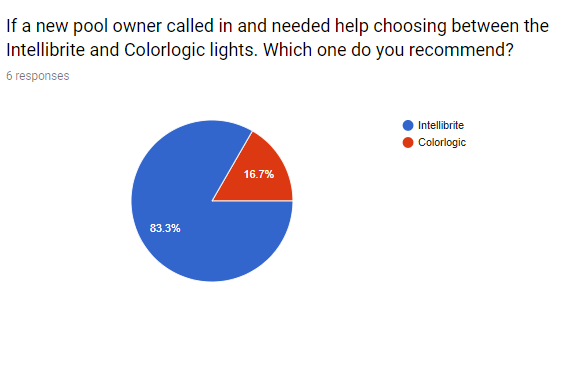 Based on your experience with customers and in the field, what is the biggest issue or concern with the ColorLogic? When the light goes out, you have to replace the entire fixture. It doesn’t sync with older models. The drives tend to go out fast- usually within 3 years. If the bulb or board goes bad, you have to replace the entire fixture. There is a lot of confusion between the different generations since they all vary and do not sync together. The new universal version is only available in 12 V.
The biggest issue is the lifespan. Most ColorLogics seem to last 2-3 years. And will start flickering ON/OFF before they eventually go out. After much research and debate, we’ve come to the conclusion that the best-LED light fixture on the market is the PureLine Pure Colors. I know you’re probably wondering how I ended up with this light, but hear me out. The PureLine Pure Colors LED light utilizes the design of the Hayward Amerlite fixture but replaces the incandescent bulb with an LED bulb. The bulb contains 441 LED lights and only uses 35 W. PureLine takes advantage of new LED technology, helping you save 80% in operational costs. The Pure Colors LED pool and spa bulb offers 7 different solid colors and 9 light shows. In reviews of the IntelliBrite and ColorLogic, a consistent downfall is the inability to replace the LED bulb. What sets the Pure Colors apart from both the IntelliBrite and ColorLogic LED lights is the pool owner’s ability to replace the LED bulb after it burns out. The IntelliBrite and ColorLogic lights have integrated LED boards that are responsible for emitting light. In these lights, you do not have the option to simply replace the bulb. For most, this can be a financial burden. A brand new LED light fixture can easily range from $600- $1,000. However, replacing an LED bulb usually costs around $149.00. That’s a huge difference in savings. Using that to their advantage, PureLine created a light fixture that incorporates LED technology and also gives pool owners the option of replacing the bulb. This saves pool owners money and saves them an extra hour or so in time. One of the great advantages of the Pure Colors light is the extended warranty. The LED bulb has a two-year warranty and the Amerlite fixture has a one-year warranty, as well. The Pure Colors LED light is available in 12 V and 120 V for pools and spas. The light fixture comes with a stainless steel face ring and also includes an incandescent bulb, as well. In comparison to the IntelliBrite and ColorLogic lights, the Pure Colors is considerably cheaper. Not just the upfront cost, but also the cost of replacement parts as well. It is a feasible option for pool owners looking to take advantage of efficient LED bulbs but not break the bank at the same time.